Get Flat ₹50 Cashback when you send money to 5 Different Users!! – Hello friends!! 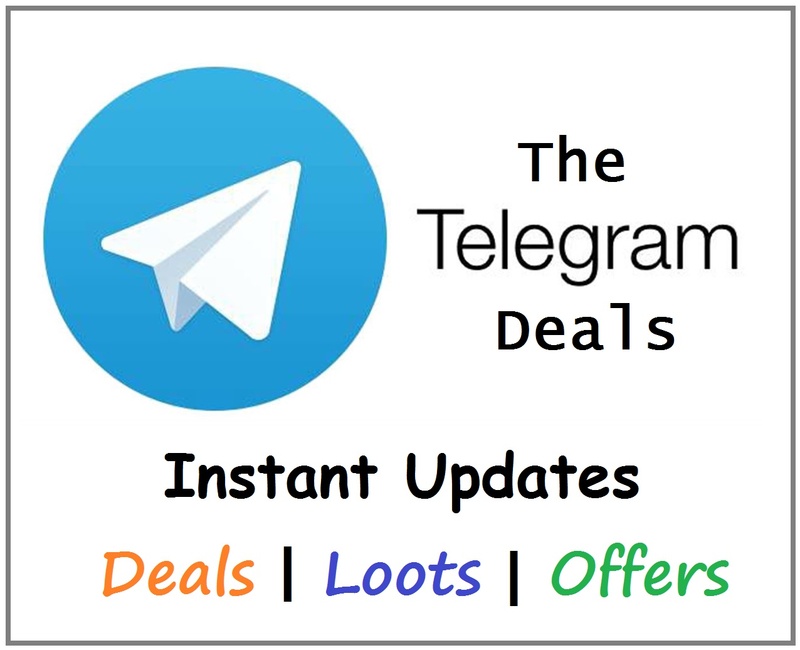 Hope you all are enjoying various loots from phonepe like PhonePe Electricity Bill Cashback, Foodpanda PhonePe Offer, PhonePe water Bill Cashback and many more. So friends today we are back with another offer from PhonePe App in which you can get ₹50 cashback when you send money on phonepe to 5 different users. PhonePe is offering many loots in past few months and also becoming quite popular and user-friendly. so without wasting much time, we will come to offer. Send money to 5 different users and get ₹50 cashback. What is minimum transaction amount? Each money transfer must be for a minimum of ₹100. Offer is valid from 00:00 hrs, 18th May 2018 and is valid till 23:59 hrs, 18 May 2018. 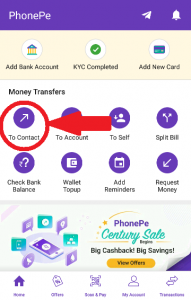 Step 1: First of all Download/Update the PhonePe App from below button. Step 2: Now SignUp/Sign In to your PhonePe account. 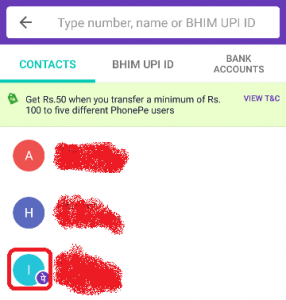 Step 3: On the PhonePe app, click on “To contact“. Step 4: Now select the contact to whom you want to transfer the money. Step 5: On the next screen enter the amount as ₹100. Step 6: Now select the method that you prefer to pay through. Note: You can select any method to pay, there are no restriction on payment method. Step 7: Now click on Send to complete the transaction. That’s it!! Now repeat the procedure from step 3 for four times more, and get your ₹50 cashback for free. This offer can be availed once per mobile device, per user/bank account number/mobile number. Cashback will be credited as PhonePe gift voucher balance within 7 working days of the end of the event. Cashback gift voucher can be used for recharges, bill payments and payments on PhonePe partner platforms/stores. Cashback gift voucher cannot be withdrawn to any linked bank account or transferred to other customers. Cashback gift voucher will not be offered if payment is made through the PhonePe wallet. 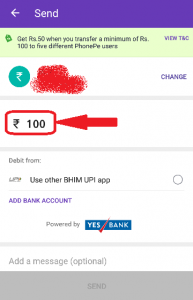 In case of partial payments using wallet balance and BHIM UPI/Cards, only the amount paid using BHIM UPI/Cards will be considered for the offer.